On May 4th, ConnectVA will present the only day-long social media conference in the region for nonprofits, government and community-based organizations! You will learn best practices, trends, and need-to-know information to connect your organization with social media to drive change. The day will feature field experts, panel discussions and a presentation and workshop from internationally-acclaimed Master Trainer, Beth Kanter, author of the “Networked Nonprofit” books. Below is a conversation we recently had with Caroline and Dean Browell – who are leading a breakout session on “Assessing and Aligning Resources in Social.” Read on to learn more about them! What are the Top 3 things you want people to know about your organization or business? Dean: Feedback is truly about finding actionable insights and helping you understand your audiences – and how to ultimately speak to them. We use actual humans to listen to your audiences – people with anthropology, psychology, and sociology backgrounds. We’ve been helping nonprofits of all sizes from all around the country for nearly seven years. Caroline: Make-A-Wish Greater Virginia grants the wishes of children with life-threatening medical conditions to enrich the human experience with hope, strength and joy. The Make-A-Wish Foundation of Greater Virginia was founded in August 1987. Since then we have had the privilege of granting more than 4,500 wishes in Virginia to children with life-threatening medical conditions. 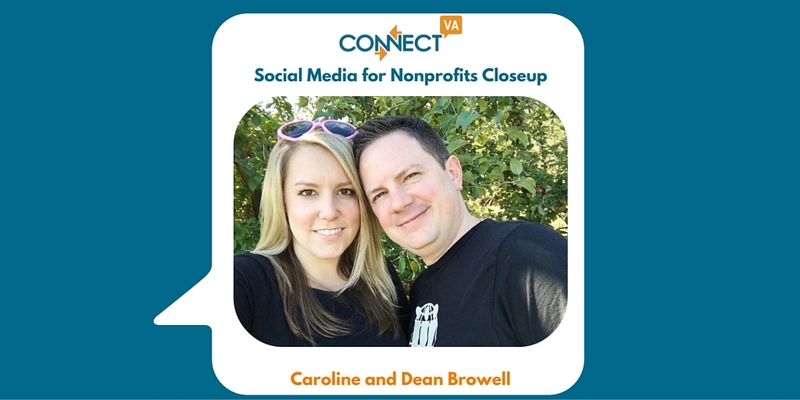 What’s the biggest trend nonprofits should be paying attention to with respect to social media? Dean: Not trying to be all things to all people on all platforms. Following the shiny objects may seem cool but it can drain resources and take your eye off the ball. Caroline: Building on that – figuring out where your constituents are online will help provide the greatest return on investment for your organization. Social media can be a great tool for nonprofits because there is no monetary cost (unless you chose to boost posts or run ads), but there is a very real cost in terms of time spent creating engaging content and effectively managing each channel. If you had to choose only one social media tool to use each day, what would it be and why? Dean: If I had to pick one channel it’d be Facebook for sure – you won’t find a social network that gives you as much in terms of stats to track how you’re doing or variables you can play with to target. Caroline: At this point, I’d have to choose Facebook as well. It’s still the most helpful for us in terms of reaching our volunteers and donors, as well as people in the community who aren’t currently connected to our organization. Why should attendees come to your workshop? We’re entering an era where many nonprofits have been doing something in social for a few years now, but they likely haven’t stopped to really assess what they’re doing or why they’re doing it (or in many cases, the people responsible for those decisions have long since turned over). Our session will help get you on your way for taking stock of what you have and where you should go. Dean Browell leads Feedback’s research and strategy as co-founder, Executive Vice President, and resident PhD with a passion for how generations interact online and an emphasis on employing ethnography in a social space. Specifically he promotes a listening-first strategy of full-social behavior understanding (putting the sociology back into social media) and not relying on software to simply take the temperature of audiences – rather digging deeper for context. Dean has brought important insights to clients such as Hershey’s, Mini Cooper, The Martin Agency, Logitech, CamelBak, Royal Bank of Scotland, BF Goodrich, CATO Fashions, healthcare systems and nonprofits across the country and more since Feedback was formed in 2009. He is a faculty member at University of Richmond’s Institute on Philanthropy for nonprofit executives and a frequent speaker nationally and internationally across an array of industries. Caroline Browell is a technologist with a big heart for assisting nonprofits in innovative ways. She is currently the marketing & communications manager with Make-A-Wish Greater Virginia, a nonprofit organization that grants the wishes of children diagnosed with life-threatening medical conditions. In this role, she responsible for implementing strategy and direction for Foundation branding, as well as development of collateral to support chapter-wide needs; she also manages the organization’s external communications and public relations activities. She previously led the communications efforts for the Richmond SPCA, one of the east coast’s largest no-kill humane organizations, where she received the RichTech Innovation award in 2014 for helping drive record pet adoptions through innovative use of social media.